What's the difference between drum and disc brakes? If you've got a pre-70s aircooled Volkswagen, the chances are you've got drum brakes on all wheels. If you've got a '70s model, you might have front disc brakes, and rear drums if you have certain Type 3's, a Super Beetle (AKA 1302 or 1303) or Karmann Ghia with 1600cc engine. So, what are the differences, and why were disc brakes brought in? Let's have a quick look at both types. So called because the braking part is drum-shaped. 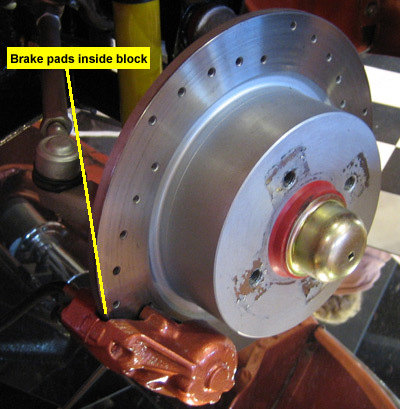 Inside the drum, two large, curved brake pads push outwards, slowing you down. 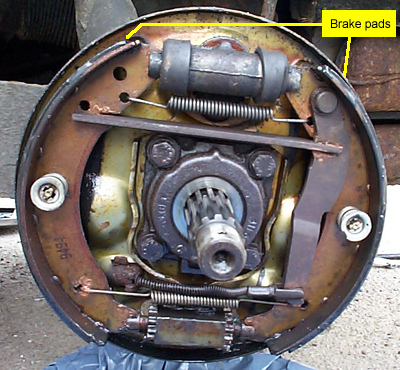 Below is a picture of the inside of a drum brake, once the drum itself is removed. The drum itself is a relatively uninteresting, slightly rusty, dish-shaped lump of metal which the wheel bolts on to. The rim of the drum is about two inches deep, completely covering everything you can see in the picture. At the top of the picture is a 'slave cylinder' which pushes the two brake pads outwards when you press the brake pedal. The pads rub against the inside of the drum, and the friction slows you down. Drum brakes are good because they're simple (although not when you're trying to put them back together) and reliable. However, they have a couple of bad drawbacks: if you go through some water, they are very ineffective until the water has drained out of the drum; and they get less efficient as they get hot. When they get hot the drum expands, growing further away from the pads, so you have to press the pedal further down to get the same amount of braking, and if they get hot enough you get very little braking at all. This is very bad news if you're driving down the side of a mountain on a switchback road, and not much better if you've been thrashing it around some country roads and need to stop suddenly. Working somewhat like bicycle brakes, disc brakes work by using calipers to clamp brake pads against either side of the spinning disc. Disc brakes are good because when they warm up, the disc gets larger and is therefore closer to the pads, meaning you don't have to push as hard on the pedal to get good braking. Also if you drive through water, it just falls off the disc so you get your stopping power back very quickly. They're also generally more efficient than drum brakes and are easier to set up. You may hear about 'cross drilled' disc brakes, this means they have small holes drilled through the face of the disc as in the picture above. The holes were originally designed to help remove gas caused by brake pads heating up, but with modern pads being much more resilient they are just there for show. Why are Drums still around? So if disc brakes are so marvellous, why are drum brakes still around? Well, disc brakes work only through hydraulics, which make them very tricky to use for hand brakes (that's 'emergency' brakes to Americans.) If you try to clamp a disc brake, as it cools down after use the disc gets slightly smaller, which means the car has to gradually increase the amount of force on the brakes to keep the car still. This is a tricker - and therefore more expensive - job than it sounds, whereas a drum brake can be held on by a cable, and usually are. Many modern cars, e.g. the VW Touran, still come with front disc brakes and rear drum brakes, and some sports cars still have a small drum brake attached to the rear brakes to act as the handbrake, although they have rear discs for the most efficient braking. If you own an aircooled Volkswagen, please rest assured that if your car came with all-round drum brakes then they are good enough to stop it within current safety distances. My Beetle only has drums, and when properly adjusted they stop the car better than a poorly maintained car with discs. However, if you're fitting bigger, non-standard engines I'd look at fitting disc brakes, either from a donor VW or using an after-market kit. Speed is great, but stopping yourself before becoming an accident is even better.